In between gardening I did this little painting for eBay. A toffee chip cupcake is decorated with fluffy butter cream frosting and sprinkled with more toffee chips. This yummy concoction sits on a black cake stand and is covered with a glass cloche. 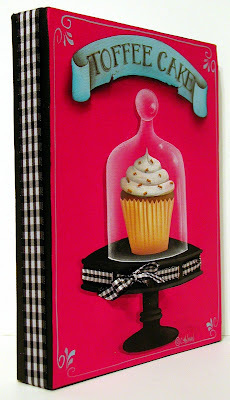 A turquoise banner at the top of the painting reveals the flavor of the cupcake. Woven through tiny slits in the canvas, a narrow black and white checked ribbon is tied in a bow on the edge of the cake plate. Black and white checked ribbon is also wrapped around the edges of the canvas. I will share some photos of my garden with you soon. Right now part of our yard is dug up so that we can bury a line to run electricity to the shed we built. I love gardening about as much as I love painting. I just wish there were more hours in the day to accomplish a little of both. Cat, your art is just beautiful! So precious! I love it, too cute! If your paintings are any indication of your gardening....I can hardly wait to see your gardens! I love the way you made the glass cloche. And what a clever idea you had with that ribbon. So cute! I love the ribbon running around the plate too! Ah, your toffee cream cup cake looks so wonderful Catherine...I love this one, right up my alley and something I would like to gobble down besides. Enjoy your gardening...I've been doing the same thing, running from the garden to the paint table. It is harder to focus at this time of the year because the garden keeps calling me outside. 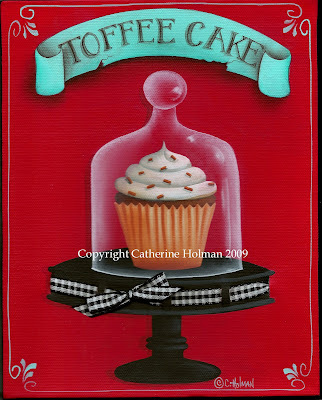 Cathie, another wonderful cupcake painting! Keep them coming! I love the wonderful woven ribbon. Such a great touch to your always beautiful and charming work. Yummy!! Love it! Looking forward to seeing your gardens. I know, Cathie! Finding that perfect balance is sometimes very hard to do. I LOVE the new painting! Your cupcakes are so adorable. Looks delish Cath! I too love gardening and I agree, we need more hours in the day! Stop by, I'm having a giveaway. As always lovely, lovely, lovely!. You are so talented.